It was night around and he was told to enter in that narrow alley. His black coat had a fur inside, but the cold was penetrating in his bones. Solitude. A rose in his hand. A music, variation 14, was played in the distance. An apparently serene toccata where two hands were chasing each other. Ornamentations and thrills. Hands chasing on two keyboards, like cats, in a desolated row, playing around. Giving and taking, exchanging and leaving. He was told what door to enter, without knocking. Only close to that door he realized the tiny hint of Arabian touch of that music. Or it was just suggestion from what he found. Drapes, incense, smoke. And golden keys, masques, boxes. 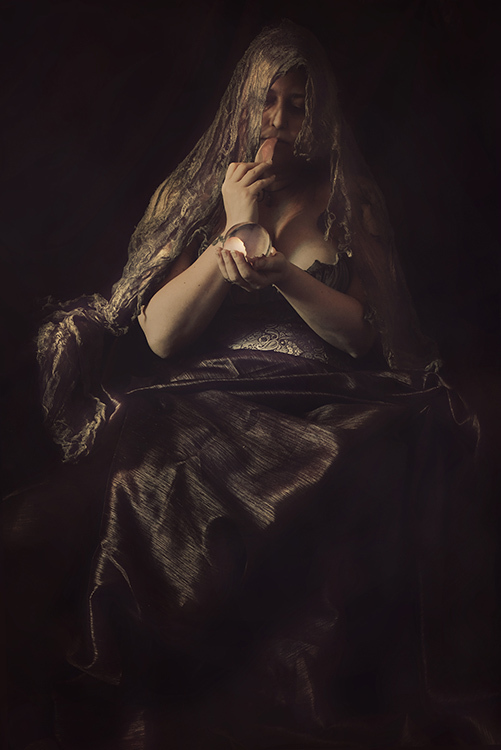 The Fortune Teller was there, immersed in her dimension; a guardian between the past and the future. A small diaphragm of present. Ornamentations and thrills were crossing the still air around. He sat, without saying a word, holding his rose and realizing his brain was interrogated and a part of it was already replying, out of his will. The rose was slowly dematerializing in his hand, leaving a subtle dust on his fingers and a temporary sense of loss. Ornamentations and thrills were becoming like a fog in his brain, making reality and present even more ambiguous and immaterial. The last thing he saw was the Fortune Teller looking at him, eating petals. Only at that point, and all of a sudden he realized he was walking on the edge of an immense cliff, in the darkest night. And ornamentations and thrills were like hands, pulling him towards the vacuum.